Medical Electronics Market size is set to exceed USD 169 billion by 2025; according to a new research report by Global Market Insights. Availability of medical equipment and devices on lease will escalate its demand among healthcare professionals thereby positively influencing the industry growth. Most of the medical electronics available in market are expensive due to integration of advanced technology. Hospitals, diagnostic centers and individual medical practitioners are reluctant to buy them due the huge investment required, and it takes good amount of time to recover the cost. The direct purchase cost of technologically advanced medical devices is high, and the cost of entire healthcare setup can rise steeply. In contrast, leased equipment are considered as tax-deductible and cost deductions are certain to reduce net medical electronic devices cost that positively impacts the industry growth. Rising adoption of technologically advanced medical electronic devices in emerging economies such as India and China will significantly boost the industry growth during the analysis period. Although the medical electronic devices are expensive, several government initiatives and favorable FDI policies will trigger the adoption of these devices among the healthcare professionals. However, stringent regulations enforced on the companies involved in manufacturing of medical electronic devices will restrain the industry growth in the forthcoming years. Respiratory care devices segment was valued over USD 6 billion in 2018 and is expected to have considerable revenue size during the forecast timeframe. Growth can be attributed to the increasing prevalence of respiratory diseases such as COPD and asthma. According to Global Asthma Network, asthma kills around 1000 people everyday globally that surges the demand for respiratory care devices thereby propelling segmental growth in foreseeable future. Clinics segment will experience 13.2% growth during the forecast timeframe. Considerable segmental growth will be as a result of high adoption rate for medical electronic equipment due to the advent of innovative and cost-effective devices. For instance, ultrasound equipment typically designed for hospitals are now being deployed at clinics. The portable ultrasound machine cost less than full sized equipment. Cost containment pressure from regulatory authorities is driving innovation aimed at introducing cost effective devices with improved performance that will boost the segment growth. 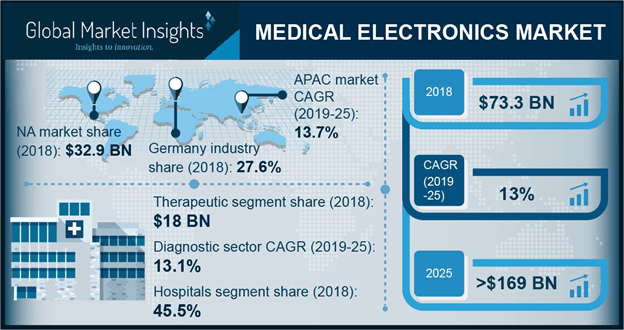 China medical electronics market witnessed 13.4% growth during the analysis period and is anticipated to grow exponentially over forecast timeframe. Growing geriatric population is expected to drive the growth. According to China News Service, by the end of 2017, there were around 241 million people in the age group of 60 years and above. Majority of the elderly population base suffers from chronic ailments that raises the demand for medical electronics accelerating the industry growth. Germany medical electronics market accounted for 27.6% revenue share of Europe market. Technological integrations by the local players operational in medical electronics market have ensured country share. Additionally, the regulations raise entry barriers for the new industry player to establish themselves in Germany that is beneficial for the local players for earning sustainable profits. Furthermore, government plays an important role in framing regulations and trade policies that favor the demand for diagnostic and therapeutic devices possessing high accuracy and efficiency. Key industry players operational in medical electronics industry include Allengers Medical, Boston Scientific, Carestream Health, FUJIFILM Medical Systems, GE Healthcare, Hitachi High Technologies, Corporation Maxim Integrated, Medtronic, Olympus Corp., Philips Healthcare and others. These players implement several strategic initiatives such as collaborations, new product launch, mergers and acquisitions to acquire potential market share. Also, receiving FDA approvals for medical electronics enhances company’s revenue generation. For instance, in April 2014, Boston Scientific Corporation received FDA approval for quadripolar cardiac resynchronization therapy-defibrillators (CRT-Ds) such as Dynagen X4 and Inogen X4 offering advanced care for heart failure patients. FDA approvals for new products will ensure profitable scenario for the company.